Available as a no-cost download (see below). 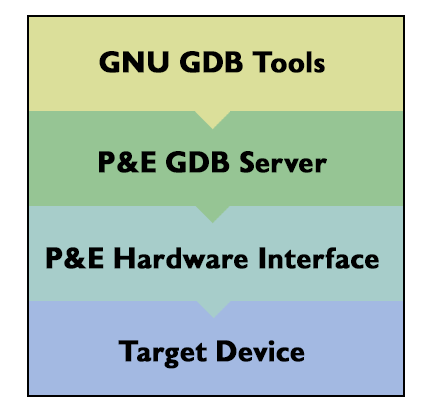 PEmicro GDB server now supports run control and FLASH programming of many ARM devices, using GNU GDB debugger tools alongside PEmicro’s hardware interfaces. Click for a complete list of ARM devices that we now support. NEW! Multi-Core project debugging. This powerful feature allows user to debug multiple device cores concurrently. While the main device core is used to load multiple .elf files for all device cores, the user can run an attach debug session on secondary cores in order to instantiate multi-core debug experience. This functionality is now fully integrated in S32 for ARM Design IDE from NXP for S32V234 (Treerunner) and 57D54H (Halo) devices. For more information about Multi-Core debug functionality please refer to chapter 6 within GDB Server User's Guide. NEW! Parallel debugging of multiple ARM devices. PEmicro plugin allows user to debug multiple ARM devices in parallel, as long as they are connected to different PEmicro hardware interfaces. The GDB Server is available as a Windows-based GUI application that can be used for easy server setting and target setting configuration.